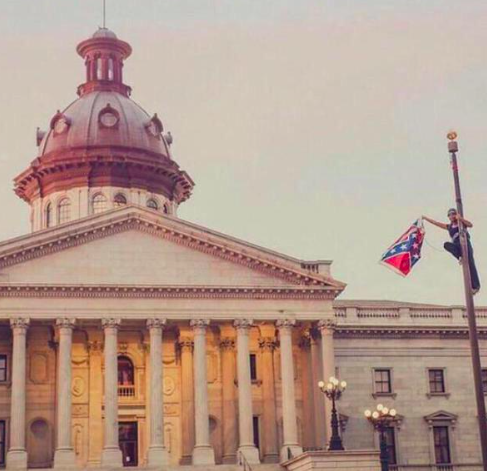 Bree Newsome, an activist, artist, and educator was arrested this morning after scaling the 30 ft. flagpole on the grounds of South Carolina statehouse. The pole that held up the confederate flag. Just before dawn she climbed the pole while another activist James Tyson stood below to make sure she didn't fall. Once at the top, Bree Newsome screamed out, "You come against me with hatred and oppression and violence. I come against you in the name of God! This flag comes down today." Further clarifying her motive for removing the flag. State police were on site just as Newsome started the climb up, telling her to come down the whole climb. Once she began her descent she quoted scriptures and made sure to let the officers know she was prepared to be arrested. She quoted the Lord's Prayer as her feet touched the ground. The removal of the flag was well planned out by Newsome and her team who are among the people in this country who believe it represents the strongest hatred this country has known. The conversation over the flag was sparked up again recently when a white supremacist Dylann Roof murdered 9 black people in a Bible study class at Mother Emmanuel AME Church in Charleston on June 17th. Bree's courageous and law defying act did land her in cuffs, but as noted she was well prepared for that. Officials took Newsome into custody and before 9 am, the flag was back up. Newsome's charges have not been announced yet, but surely her bail money is ready. See her courageous demonstration below.